In the latest issue of Sailing World there is an article by Gary Jobson about his "bucket list", the sailing things he would like to do before he kicks the bucket. Now you would think that in 50 years of sailing a guy like Jobson has done it all. But no. The article is entitled There's Much more on the Horizon and he is full of ideas. 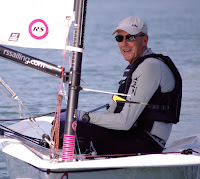 Among other things he muses about organizing a crew of veterans and youngsters to race for a major championship title; learning to jibe a foiling moth; campaigning a Melges 32 or a Laser SB3; having a shot at the A Scow title with Buddy Melges in his crew; team racing; cruising to the Galapagos and South Georgia Island; and breaking the 50 knot barrier. 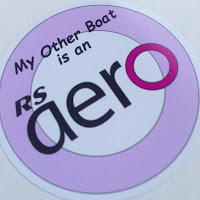 Take a Laser out in the surf, somewhere in the tropics, sail upwind for 20 miles in the ocean and then back downwind in 35 knots. Launch 10 Lasers off a ship in mid-ocean in 25 knots or more with 15-foot waves. Take his (as yet unborn) grandchildren sailing. Good to see that a guy who has won the America's Cup, and with almost any sailing opportunity open to him, still knows what really matters in life. Laser sailing and grandkids. Love it. A Laser in 35 knots of wind and/or 15' seas sounds a bit ambitious to me. I think my list will be a bit tamer than that.